Cavalcade is a remarkably boring film. There is a good story desperate to get out and capture how history has overwhelmed and tied two British families: the upper-class Marryots and their servants the Bridges. However, it appears that at times Cavalcade was less an adaptation of the Noel Coward play and more a film of the play itself. We begin on New Year's Eve 1899. The upper-class Marryots and their servants, the Bridges, although separated by class and status, are facing a similar circumstance: both Robert Marryot (Clive Brook) and Alfred Bridges (Herbert Mundin) are going to fight in the Boer War. The women: Jane Marryot (Diana Wynard) and Ellen Bridges (Una O'Connor), must endure their absence and the agony of not knowing whether their husbands will come back or not. They do come back, none too affected, and go their separate ways: the Bridges to open a tavern, the Marryots to continue whatever upper-class recently-knighted families do. The Marryots have two sons: Edward (John Warburton) and Joey (Frank Lawton), while the Bridges have a daughter, Fanny (Ursula Jeans). Edward is the more responsible of the two, Joey (or Joe when he grows older) the more happy-go-lucky one. Fanny from childhood appears to have one dream: to sing and dance on the stage. The changing world between the death of Queen Victoria in 1901 through the First World War and up to New Year's Eve 1933 are experienced by the Marryots and Bridges, with their lives intertwining in the years between. The sinking of the Titanic all through the Great War affects both groups, with Joey and Fanny finding each other right after war breaks out. Most of the men die, but the women continue. If there is a flaw in Cavalcade, and it's a big one, is that for all the events that overtake the families, we never really stop to see how all these events affect them as people. The entire project has them more as slightly disinterested bystanders to events both major and minor, with very little insight into their true reactions and feelings. For example, Edward and his love, Edith Harris (Margaret Lindsay), are on their honeymoon aboard a massive ship. I suppose that because we're given the date of April 14, 1912 on the screen we should know what ship they are on. Put aside the fact that now there's no real mystery as to their fate: the bigger problem is that this cataclysmic event to which the Marryots are intimately impacted by barely registers a blip with Edward's parents, brother, or Edith's mother Margaret (Irene Brown), Lady Marryot's best friend. No matter what event comes across their lives, it never seems to register on any of them as individuals. They are all rather removed from it all, so we never see them, in particular the Marryots, as more than cardboard figures who can at most only commentate on tragedies rather than be impacted by them. I put that lack of emotion not on the stiff-upper lip mode of British life, but on the fact that director Frank Lloyd had to rush on to the next event in Cavalcade without really worrying about how losing a son and daughter-in-law would impact the family. I think the title Cavalcade is erroneously: a better title would have been Catalogue, since the film seems more interested in making note of the fact that certain events happened around the families as opposed to have affected them. Take for example after the Bridges leave the Marryots to open their tavern. We start Cavalcade by seeing Alfred as a good working-class chap, loving to his wife and infant daughter, enthusiastic about life and the future. Next time we see him, he's a lush. We never see his transformation, what, other than having ready access to alcohol, got him to that state. He isn't a brute, but certainly less caring and kind than he had been. However, this 360 degree turn appears to be of no interest to Lloyd or screenwriter Reginald Berkeley. The audience doesn't need to know how he got to degenerate to his sorry state: we just accept it. We don't have to know how Alfred's end affects Fanny, or how Edward's end affects Sir Robert and Lady Marryott, and exactly why and how did he end up with a knighthood in the first place, or Joey. None of these things, the emotion behind the events, matter. The only thing that matters in Cavalcade is that they were around to witness them. As a result, both the Marryots and Bridges rarely become ordinary people caught up in the tide of history. Instead, they just happen to be around. As I stated earlier, Cavalcade suffers from Lloyd's uninspired direction. Often, the sets looked like sets, and while that can be forgiven in many films, in Cavalcade it only enhanced the rather stage-bound effect the film overall has. The film looks as if it were taking place on a stage and someone opted to roll cameras. The best, or worst, example is when Mrs. Bridges and Lady Marryot meet for the last time to discuss their children's affair. It looks like a set, and that instantly removes you from a sense that this is real. It looks like you are watching it from a theater seat, to where you focus more on that than on what is happening between the characters, not that their weak direction doesn't help in that department. Very few times were we allowed to go outside, and when we did, Lloyd appeared more interested in showing us a song-and-dance pier show than the encounter between the Widow Bridges and Lady Marryot and their respective families. For sheer performances, few films appear to have such terrible ones as Cavalcade. I won't put the blame on the actors themselves: O'Connor and Mundin did the best they could as the working-class Bridges, and their scenes together were quite effective. However, the younger set appears to be like most of the film: blank and empty. The scenes between Jeans' Fanny and Lawton's Joey are especially stilted. We never get a sense that these two are desperately in love in spite of their shared history. Like most of Cavalcade, we have to fill in the blanks as to what is really going on. They are the primary example of this disjointed film: when they meet as adults, we get the suggestion that they find themselves drawn to each other, then the lights fade and when we see them next, we're suppose to believe they are passionately in love. The worst performance in Cavalcade is, to my mind, ironically the only one singled out for an Oscar nomination as Best Actress: that of Diana Wynard. Thorough all of Cavalcade she is very mannered (not unlike Luise Rainer), given to staring out into the distance, in short, acting for the camera as if she were acting on the stage. It only enhances the effect that Cavalcade has: one where it appears so stage-bound it never becomes real or authentic. She faints at one point, but sadly, it comes off looking fake. I don't want to fault Wynard herself. I fault Frank Lloyd, who for some reason never seemed interested in his performers. She delivers a closing speech where she almost appears to be speaking directly to us but at the same time appears to be speaking to no one. Would it have killed Lloyd to move the camera a bit for a close-up of Wynard, a reaction shot of Brook, a montage of her memories? A little more imagination would have saved Cavalcade, but Lloyd didn't have any. 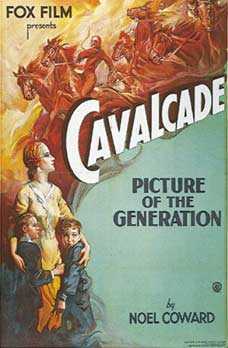 Cavalcade at its heart has the potential of a good story: two families caught up in the maelstrom of history sweeping them into modernity and its chaos. As executed here, Cavalcade is a slow, lumbering, stagy, dated film that is more a "Greatest Events" series than a true family story. There are a few good moments (the montage of World War I was quite effective) but in the end Cavalcade will make for a dull evening with a Coward. Please visit more of the Best Picture reviews.